It was a early start, before 7am the paramedics were at the base. The main point concern everyone was talking about was the weather. There had just been a few days of bad weather with almost no flying being done. There were still dark clouds inland, but at least patches of blue sky over the sea. The consensus was that it was going to clear and that it would be a good flying day. The pilots and the flight coordinator were checking weather reports and it looked like the weather was improving. The flight paramedics for the day were Calvin Bridjbal and Mr Soneel Sookoo, experienced Advanced Life Support paramedics, both, with many hours of flight experience. They completed their documentation before checking the helicopter. The pilot Kevin Donellen had already done his checks. The paramedics are responsible for checking the medical equipment on the helicopter. Kevin checks the helicopter as jets rumble in the back ground as they take off and land. The checks are vitally important; there is no room for error. Everything needs to be in working order. The helicopter we were flying on is a Eurocopter EC 130 B4, with a medical conversion, which allows a patient to lie flat on a specialized stretcher and there are several other adjustments including, oxygen connections and brackets to hold equipment etc, which have been made to support, the treatment of a patient in the helicopter. After the all the checks have been done, the crews gathered in the crew room, they were relaxed. They are telling me stories from their previous missions, which ranged from landing in confined emergency landing zones, on the side of a mountain to how they hate watching movies about aeroplane crashes. The relaxed atmosphere changes suddenly as the flight coordinator informs us that there is a possibility of a flight. An ICU patient needs to be transferred. The paramedics listen carefully to the flight coordinator as she tells them the information that she already has about the patient. 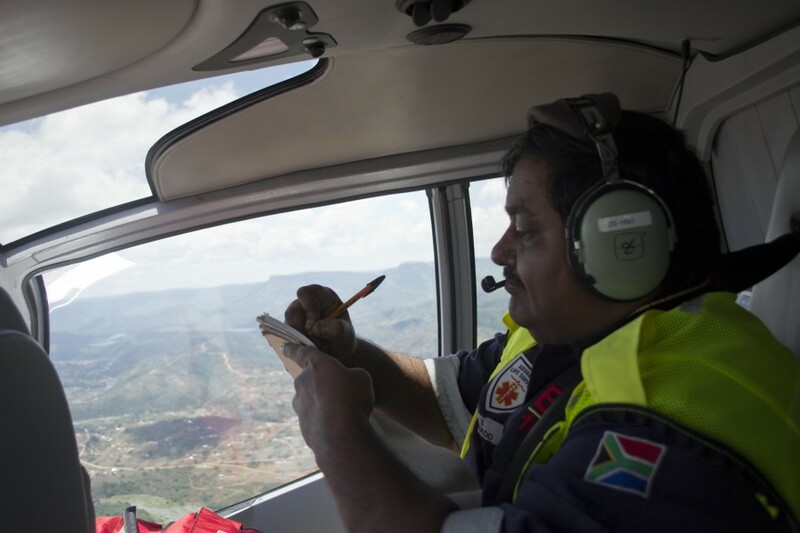 The paramedic’s start discussing, what equipment they think they will need for the patient, while the pilot checks weather reports for the Pietermaritzburg area, where the patients is. After a few minutes the authorization for the flight has been given. The paramedics go over the additional information provided about the patient; they decide that they need to take some additional equipment with. The patient is a critically injured man, who is currently still in theatre being operated on. He had been hit by a motor vehicle, the previous night. The pilot is interested in the patient’s weight, to make sure the weight limit of the helicopter is not exceeded. The helicopter has skids and it is rolled out the hanger on a specialized set of removable wheels, which can be attached and detached to the skids, onto the apron in front of the hangar. All operations on the helicopter are safety orientated. Kevin gives us a refresher on the safety precarious, before we get in. The flight crew sit in the rear section of the helicopter cabin but that doesn’t mean they can relax. 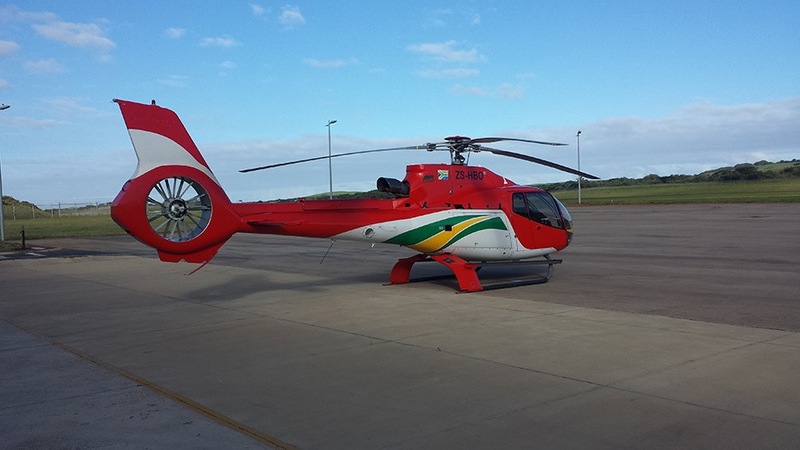 The mission’s safety is everyone on the helicopters responsibility and everyone has a role to play during the flight. All items and equipment in the aircraft need to be secured as turbulence or at the worst, during a crash, the equipment can become a projectile that can strike you. Kevin preforms safety checks and checks that we are buckled up in our four point safety harnesses. He starts the helicopters turbine engine and the blades start turning, slowly at first but soon becoming a blur, then invisible as they turn at several thousand RPM. We are ready to take off and we can hear Kevin talking to the air traffic controller over our headsets. The Kevin confirms our call sign , helicopter make and destination with the controller, “ mercywing 5, a EC130 helicopter on a mercy mission to Edendale hospital in Pietermaritzburg, mercywing 5” before gently taking off, the aircraft feels weightless in the air and once we are few meters in the air we start flying forward and fly along the taxi way before making a banking turn and we start climbing in height on our 25 minute flight to Pietermaritzburg. During the flight Kevin is in contact with air traffic control, who direct what height we need to fly at. During the fight we are all on the lookout, checking for other aircraft and large birds, that circle and soar on the hot air thermals made by the hilly KZN tertian below us. We manage to safely spot the pair of micro lights, small helicopter and large soaring brown eagle that we shared airspace with on the flight. As we approach Pietermaritzburg air space the Durban air control hands us over to Pietermaritzburg air traffic controller, who directs us to fly higher to allow a jet, which is below and in front of us to land at the airport. 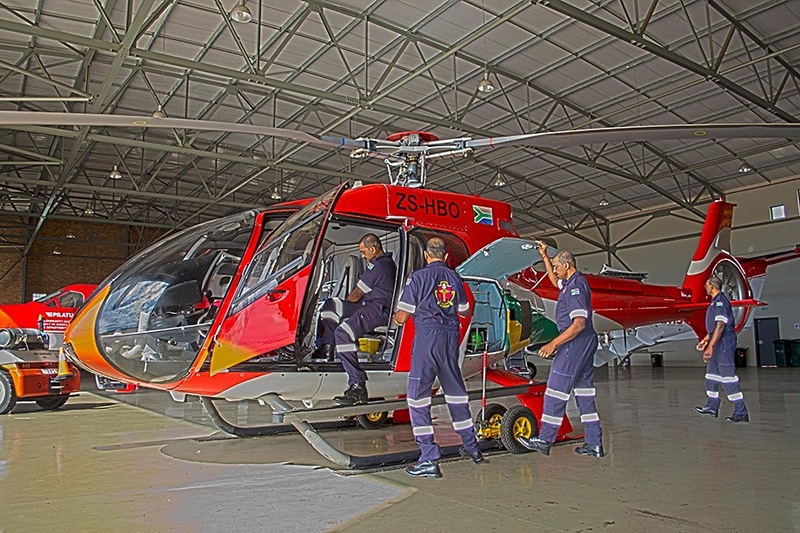 We fly over Pietermaritzburg and circle the hospital several times on a down ward spinal as we decrease height and speed. The landing zone is clear and Kevin skillfully lands on the landing zone. With the blades still turning and engine running on of the paramedics get out and standson the side of the landing zone, to make sure no one approaches the helicopter. After the aircraft has been shut down and secured, an ambulance crew meet us and drive us around to the other side of the hospital at the main block ,where the intensive care unit is. The patient has come out of theatre during our flight up and is in a critical but stable condition. The paramedics get a hand over about the patient from the Doctors, before preparing to move the patient. Before the patient can be transferred, all the equipment that is being used on the patient, needs to be changed to the equipment that has been brought with on the helicopter. This includes the ventilator, vital sign monitors and infusion control devices. Once all this has been changed the patient is moved onto the stretcher that loads into the helicopter. Once the patient was secured to the stretcher and the paramedics were happy that the patient could be transferred, they wheel the patient back down to the ambulance, which was used to drive us back around to the helicopter. The ambulance crews help the flight paramedics to load the patient into the helicopter. The stretcher the patient was lying on was secured and all the equipment being used was also secured. The helicopter has a large oxygen cylinder but no auxiliary power to connect the infusion devices, ventilator and monitors to. They are there for battery powered. We take off and circle the hospital while Kevin confirms with the air traffic controller that we have permission for our direct flight path to Inkhosi Albert Luthuli Central Hospital in Durban. The flight path is confirmed and we start flying in the direction of Durban. Kevin’s Tablet has a flight map on, with a white line between the hospitals. A blinking helicopter icon, flashes, moving along the white line, showing that we are on a direct flight path to the hospital. This while the N3 highway, the main highway between the two cities, with lots of traffic on, snakes back and forth underneath us. With the patient now on board the altitude we flew as was lower, which meant greater danger from ground objects like power lines, terrain and birds. Fortunately the flight was uneventful. A large circling bird had seen us before we saw it and it had swooped down and to the left of us and the patient had had not deteriorated. The landing zone at IALCH is on the roof. We landed safely on the large diameter zone and were met by the receiving team of Doctors. They checked on the condition of the patient, before helping to off load the patient onto a stretcher. When down in the trauma casualty the flight paramedics formally hand the patient over to the team of Doctors and help to change that patient over to the hospitals equipment. The patient was in good hands with several Doctors, continuing his care at the level one trauma facility. The patient was handed over but the mission was not complete. The equipment was packed back and secured in the helicopter. Again Kevin preformed his safety checks before starting the engine and confirming our flight route with air traffic control. We took off, flying over Durban to the coast, where we turned north, back to the airport. We passed the iconic Moses Mabhida stadium, with its large towering arches. The beaches below us, were packed with hundreds of people enjoying the warm afternoon summer weather, some camped out on the beach while others swim. I would say most of them oblivious to us flying past 800 ft above them. The air traffic controller slotted us in to land between a jet liner taking off and another landing. After a sharp banking turn into the wind, Kevin skillfully maneuvered the helicopter side wards while hovering to land on the apron in front of the hanger. Another successful mission completed, helping to save the life of a man the paramedics never knew and who they will properly never meet again. 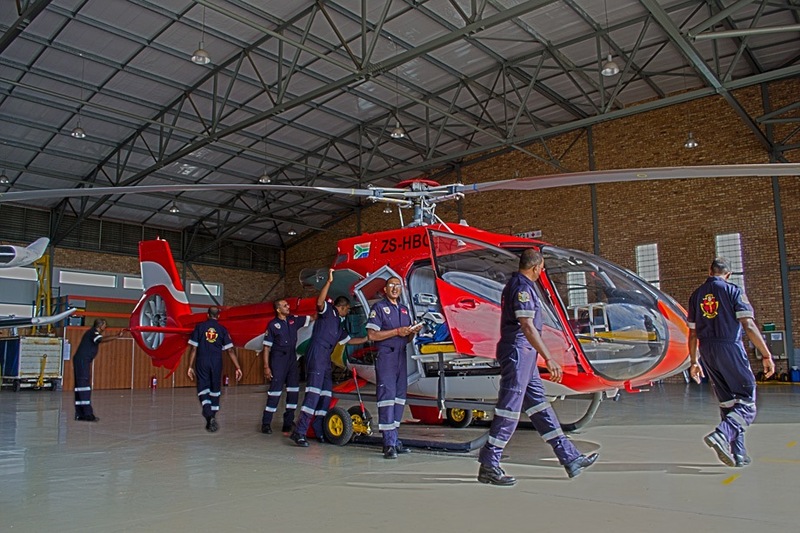 The paramedics unpack the medical equipment that they need to clean and charge, while the pilot waited for the fuel truck to come refuel the helicopter. It was late afternoon and there wasn’t another mission for the shift. A shift where the pilot and paramedics helped to save a life. A shift which most people don’t even know about. A shift which was just another “day in the life of a flight paramedic”.